Comments: This is a premium quality Madagascar Live Plant Bulb, that will sprout and grow into a rare plant in your aquarium. Origin: Originally this plant species was discovered Madagascar, a large off the East Coast of Africa. But now this plant is cultivated on a famous aquarium plant farm, and at this time it's found growing in aquariums all over the world. Maximum Size: The maximum size for this plant is more than 24" tall. Compatibility: this plant does well with most kinds of aquarium fish, except those that need salt, those that dig and uproot plants like many Cichlids, and those that routinely eat plants. Temperature: This plant likes temperatures that range from 70 to 80+ degrees F.
Generally we don't recommend temperatures above 80-degrees F. in aquariums, because the oxygen level begins to drop rapidly above 80-degrees, and this is not good for most fish. However this plant seems to tolerate temperatures above 80-degrees F.
Water Conditions: This plant likes water with a pH of 6 to 7 with mild hardness. Most water in the U.S. has a higher pH and is harder. Wwe've seen this plant doing very well in an aquarium with 100% RO-water, which probably has a pH of 6 to 6.5 and almost no hardness. Aquarium Size: This plant can grow to be more than 24" tall. Decor: we've found that it's best bury these bulbs in gravel in a terra cotta flower pot. So it can be easily moved around. Aquarium Filter: Bio-Wheel Filters are highly recommended for aquariums with fish. But plants usually do better without a Bio-Wheel Filter, because Bio-Wheels quickly remove CO2 from the water, and plants need CO2. The addition of Lava Rocks will keep nitrates in the ideal range for fish, which is not too low for plants. Click here to learn more about using Lava Rocks in aquariums. Life Span: this live plant can live for several years and sometimes many years with proper care and good water. Popularity: For a long-long time Live Plants like this one have been very popular. 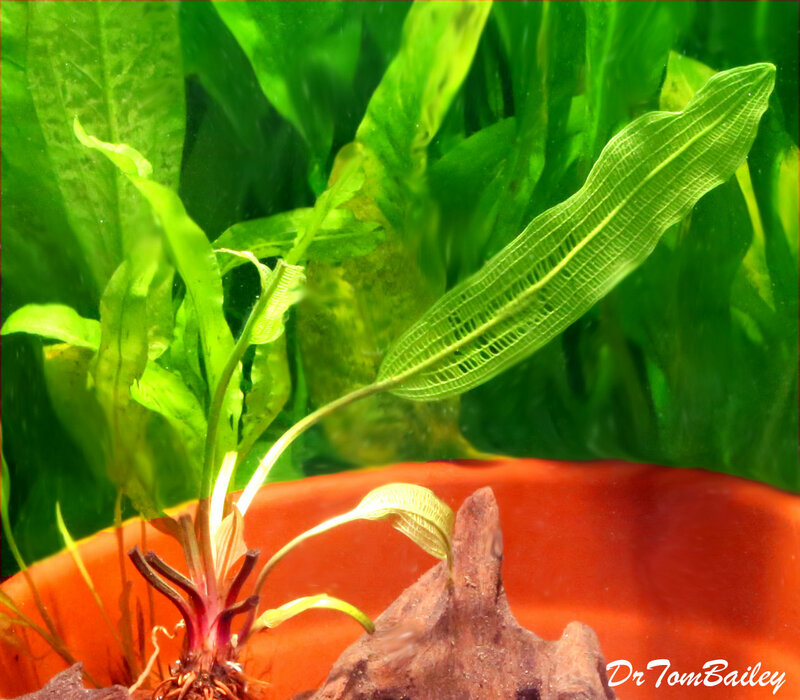 Names: The scientific name for this plant is Aponogeton madagascariensis. Variations: We've not seen any variations.